This baked eggs dish can be lifted in so many ways once you have the basic tomato sauce, which can be made ahead of time - add chorizo, jamon, mushroom or spinach to give it body. Then finish with labne, grated manchego cheese or Persian feta. Sprinkle some pistachio dukkah over for some added crunch. Lightly toast spice seeds in a dry frying pan over low heat for a minute until aromatic. Using a spice grinder, grind spices to a fine powder. Heat oil in a heavy-based saucepan over low heat and fry onion and garlic until soft and translucent. And ground spices, paprika and tomato and cook gently for one hour or until thick, then season to taste with salt and pepper. Blanch spinach in boiling water for 20 seconds and refresh in cold water; squeeze the water from the spinach. In four small cast-iron pans or ovenproof bowls, mix some spinach and tomato sauce. Season with salt and make two hollows in each pan for eggs to sit in. Break eggs into the sauce and place in the oven. Cook until the whites are set and the yolks are runny. 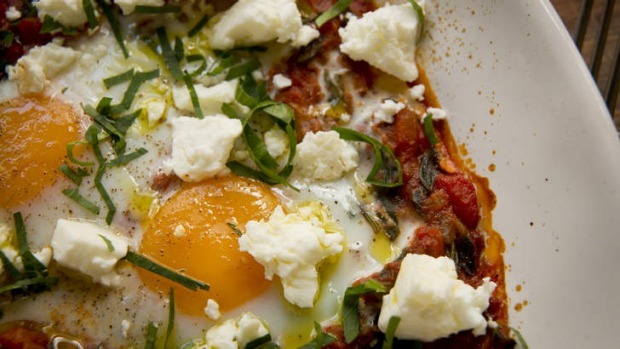 Place pan on a plate, crumble feta over the eggs, then finish with parsley. Serve with toast.